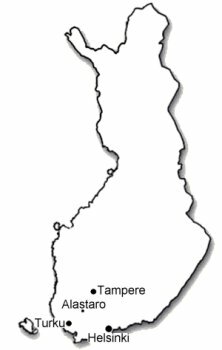 Distances: Helsinki 165 kilometres, Tampere 110 kilometres, Pori 100 kilometres, Turku 80 kilometres, Forssa 55 kilometres and Loimaa 20 kilometres. Communications: The nearest bus stop is 4 kilometres away, the nearest railway station in Loimaa, 20 kilometres away. The Airport of Turku is 70 kilometres away. We can also come and meet you at the station or somewhere else, if just agreed beforehand. Driving instructions: there are signs with ear of corn in the centre of Alastaro. Just follow them about 4 kilometres and you are at Kannisto.